3International Academy of Orthopedic Medicine – United States, Tucson, Arizona, USA. 4Center for Rehabilitation Research, Texas Tech University Health Sciences Center, Lubbock, Texas, USA. 5Advanced Physical Therapy of Alaska, Anchorage, Alaska, USA. Thoracic-four (T4) syndrome is a clinical condition that involves upper extremities, trunk and neck symptoms. It is postulated that the sympathetic nervous system is mainly responsible for the manifestations of this clinical entity. Only a few articles address the main features of the pathophysiology, diagnosis and treatment of this condition. The aim of this report is to present the evaluation and treatment of a patient who demonstrates clinical signs and symptoms consistent with T4 syndrome. Specific exercise therapy is integrated into the rehabilitation program as a new option for pain modulation. An update on the theory to explain the possible pathophysiological mechanism of T4 syndrome is proposed, with implications on the clinical decision-making process. There are only a few articles that describe this clinical entity. However, it has been well accepted that thoracic mobilization techniques are the treatment of choice for this condition. 7,8,9,15,19 Exercise therapy has only been mentioned as a secondary component in the rehabilitation process. Recently, a set of symptoms similar to that of T4 syndrome was described in a case report, however in this case the lower extremities were affected. Interestingly, thoracic mobilization techniques for the thoracolumbar junction, which was assessed as hypomobile, relieved symptoms. This clinical entity was termed “T10 syndrome” due to the reduction of bilateral leg symptoms using thoracic mobilizations (analogous to the bilateral arm symptoms in T4 syndrome).13 These findings highlight the possible role of the autonomic nervous system (ANS) as a plausible source of musculoskeletal symptoms. The purpose of this case report is to describe the evaluation and treatment of a patient suffering from T4 syndrome, incorporating manual therapy techniques and a novel exercise treatment approach oriented to pain modulation and postural control. Additionally, an updated theory for the pathogenesis of T4 syndrome is proposed. A 34-year-old female was referred to physical therapy for treatment of fibromyalgia. She had 4 children, all delivered naturally. The patient worked as a receptionist in a chiropractic office. She had undergone multiple testing procedures, including blood tests, CT scan of her brain and spinal X-rays without evidence of any serious pathology or signs of a condition that would explain her symptoms. She was treated at her workplace, which consisted of myofascial release and chiropractic adjustments, with temporary relief. Past trauma history included a motor vehicle accident in 2004 and a fall in the bathtub when pregnant with her fourth child in 2000 (landing on her buttocks). She experienced minor pain following these two episodes, but states symptoms resolved shortly thereafter. Medical background included allergies to certain foods (e.g. chicken) and medications (Milnacipran, Cyclobenzaprine), and she had been diagnosed with depression (no medication). Surgical history included clavicle cyst removal and tubal ligation in 2000. She was not taking any medication, except for vitamin D3 supplement and probiotics. Patient described a 1-year history of pain, gradual in onset and without specific precipitating event. She had experienced brief episodes of low-intensity low back and neck pain in the past, but these were self-limited and were not related to her current complaints. Pain distribution involved both upper extremities (equally affected), neck and head. Although these areas were the most significantly affected, other parts of her body were also painful, including mid back, chest, low back and lower extremities (she reported feeling pain “from head to toes”). (Figure 1) She described her symptoms as “aching” and “throbbing”. She noted that her skin sometimes felt “warm” and “sweaty”, especially in the upper and lower extremities, and stated that her hands and feet felt “swollen”, “tingly” and were “red” in appearance. When asked to rate the pain on a scale from 0 to 10, with 0 being “no pain” and 10 being “emergency room pain”, she reported her symptoms ranged from 6/10 at the least and 10/10 at the worst. The patient reported being unable to perform daily activities in the same capacity as prior to the onset of symptoms. This increased her anxiety level since she was unable to keep her house clean (with significant difficulty performing activities like mopping and vacuuming). She had difficulty sleeping at night as she was unable to get comfortable in bed; she slept between 2 and 4 hours, awakening several times due to pain. Patient had persistent constipation and bloating, which further impaired her daily performance. Aggravation of symptoms occurred with mild exertion and sustained positioning (as short as 2-3 minutes), especially sitting. Headaches increased when upper extremity symptoms were exacerbated. Flare up of symptoms after exertion could last up to 1-2 weeks, having gradual and/or spontaneous reduction. Heat increased symptoms and cold did not change them. Only temporary reduction of symptoms could be obtained by gentle massage that she usually received at her workplace. The Fear Avoidance Belief Questionnaire (FABQ) and the Fibromyalgia Impact Questionnaire (FIQ) were completed. Patient scored 24 on the FABQ Physical Activity subscale (where maximum score is 24) and 17 on the FABQ Work subscale (where maximum score is 42). A high score on the FABQ predicts high pain avoidance behavior. In regard to the FIQ, patient scored 90.2 points using the 10-item method (maximum score is 100 and a higher score indicates a greater impact of the syndrome on the person). A summary of the clinical examination findings is listed in Table 1. Observation Head positioned in right rotation. Trunk positioned in right rotation and right sidebending. Very mild scoliotic curve (upper thoracic right, mid-lower thoracic left and lumbar right convexity). Thoracic DorsoVentral mobility Significant hypomobility was noted in the segments from T2-3 to T6-7, and at T9-10. With testing of each hypomobile segment, the patient’s symptoms were reproduced. Table 1. Clinical examination findings. Examination of the patient was limited due to intensity and high irritability of symptoms at the time of the evaluation. However, a predominant pattern of upper extremities and back pain was revealed that was associated with paresthesia in both hands and symptoms consistent with a possible sympathetic up-regulation (sweating, redness, swelling, tingling, etc.). Fibromyalgia was the referral diagnosis. Overviews of patient symptoms revealed consistency with most symptoms of fibromyalgia: pain in the four quadrants of the body, digestive system symptoms, sleep disturbances and headaches. However, the prevalence of hand symptoms in a glove-like distribution raised the possibility to additionally clinically diagnose T4 syndrome; this was further supported by hypomobilities found at the mid and lower thoracic segments, specifically T5-6, T6-7 and T9-10. The latter level reproduced lower extremity symptoms upon testing, leading to suspicion of T10 syndrome as well. After completion of the clinical examination, the patient was educated on the clinical diagnosis and treatment plan. Two distinctive rehabilitation phases were established. Phase one was oriented to reduce irritability and intensity of symptoms, thus providing relief and increasing tolerance to therapy. Phase two aimed to further reduce her symptoms, and also improve functional capacity by means of inclusion of exercise therapy into the management plan. All treatment phases consisted of one-hour sessions that included soft tissue and joint mobilization for the mid thoracic spine based on initial evaluation and session-by-session assessment. Diaphragmatic breathing was taught on the first session in an attempt to reduce anxiety and provide the patient with an active behavior tool to control her symptoms.6 Exercise therapy was included in phase two (which started at session 5). Phase 1 Goals: Reduce the irritability of patient’s symptoms; gentle improvement of myofascial and joint integrity; sympathetic down-regulation. Phase 2 Goals: Pain reduction and improvement of myofascial and joint integrity. Treatment became more localized to the T4 area since symptoms from distal segments had resolved. Intensity of manual therapy increased in order to reset the sympathetic system. Manual therapy became more specific at each subsequent session, focusing on the fibrous painful bands of myofascial structures in the upper thoracic spine, mobilizing the hypomobile and painful thoracic segments in rotation, and performing rib mobilizations where indicated. Phase 3 Goals: Resolution of local restrictions, both in soft tissue and joint structures. Tolerance to exercise was excellent, and emphasis shifted to increasing intensity and duration of bimanual exercise, especially at home. Patient was also able to incorporate elliptical exercise and resume normal daily activities. Table 2. Description of treatment sessions. Soft tissue techniques included moderate-intensity, slow stroke massage over the thoracic spine, followed by very gentle skin rolling technique in the direction of myofascial restrictions according to initial evaluation and session-by-session assessment (Figures 2 and 3, respectively). It would usually take about 15 minutes to complete this part of the treatment, and the patient often reported moderate to significant relief and relaxation after these techniques. Attention was given not to exacerbate symptoms and to continuously assess soft tissue changes associated with the application of these techniques. After soft tissue mobilization was completed, joint mobilization of the restricted, hypomobile segments was implemented, including thoracic posterior-anterior and rotational mobilization, costotransverse and costovertebral joint mobilization. (Figures 4 through 9) Joint specific technique application would usually last 30 minutes. Thoracic posterior-anterior mobilizations were performed in an oscillatory fashion, at an estimated frequency of 0.5 Hz. Attention was placed on reproduction of patient’s symptoms while performing techniques; thoracic posterior-anterior mobilization would normally reproduce her local and referred symptoms, and the technique was maintained until symptoms resolved. This would usually take 1-3 minutes, depending on the technique, segments and phase of the treatment; in phase one, three to four minutes were necessary to relieve symptoms, while only 30-60 seconds were required toward the end of the phase. Rotatory joint mobilization of the thoracic spine, costotransverse and costovertebral joint mobilization were performed in a sustained, non-oscillatory fashion of 4-5 sets of 45 seconds hold, or until hypomobility was resolved. Figure 2a and b. Slow-stroke massage. Patient is prone. Gentle movement of the therapist’s flat hands over the skin at the thoracic level is performed. Strokes are performed in a circular fashion; the aim of this technique is to prepare patient for the rest of the manual therapy techniques. Figure 4. Posterior anterior (PA) mobilization for thoracic segments. Patient is positioned prone with a towel roll under sternum to protect the cervical spine (keeps the neck from hyperextending during PA pressure of the thoracic spine). Hands are placed parallel over the transverse processes of the caudal vertebra of the segment being mobilized. Pressure (with oscillation) is performed in a direction of 60° anterior-caudal to respect facet joint orientation. Figure 5. Rotation mobilization. To treat T4-5 right rotation (as pictured). Patient is prone with a towel roll under the sternum. The therapist stands on the side of rotation to be improved (eg., on the right side to improve right rotation). Right hand is placed on right transverse process of the fifth vertebra (stabilizing hand). Hypothenar eminence of left (mobilization) hand is placed on left transverse process of the fourth vertebra, and exerts a cranial, lateral and ventral pressure. Figure 6. Costotransverse mobilization for ribs 2-5. To treat left 4th rib (as pictured): Patient is in prone with pillow placed diagonally from right shoulder to left abdomen to allow left ribs to be free from the table. Head is positioned in left rotation to lock the thoracic spine. Therapist’s left hand stabilizes the transverse processes on the right side; right hand is placed just lateral to the costotransverse joint. Pressure is exerted in a ventral and slightly lateral direction. Figure 7. Costotransverse mobilization for ribs 6-10. To treat left 7th rib (as pictured): Patient is in prone with pillow placed diagonally from right shoulder to left abdomen to free left ribs from the table. The trunk is prepositioned in left sidebending to lock the thoracic spine. Therapist’s right hand stabilizes transverse processes on the right side; left hand is placed just lateral to the costotransverse joint. Pressure is exerted in a ventral, lateral and slightly cranial direction. Figure 8. Costovertebral joint mobilization for ribs 2-5. To treat left 2nd rib (as pictured): Patient is in supine. The therapist’s right hand is placed on the rib to be mobilized while the left hand positions the patient’s left arm into elevation until movement on the 2nd rib is perceived, thus stabilizing the 1st rib. Pressure is then exerted with the right hand in a caudal and slightly dorsal direction. The rib can be prepositioned in an expired position by asking the patient to exhale. Figure 9. Costovertebral joint mobilization ribs 6-10. To treat left 7th rib (as pictured): Patient is lying on her right side. The therapist’s right hand is placed on the rib to be mobilized while the left hand positions the patient’s left arm into elevation until movement of the 7th rib is perceived, thus stabilizing the 6th rib. Pressure is then exerted with the right hand in a caudal direction. The rib can be prepositioned in an expired position by asking the patient to exhale. Exercise therapy consisted of an ‘in-phase’ movement sequence, which by definition implies the activation of homologous muscle groups on both sides of the body.25,26 The sequence selected for this patient included internal and external rotation of shoulders and hips. (Figure 10) She performed this exercise for 15 minutes after manual therapy procedures during the second phase in her plan of care. She was also instructed to perform this exercise at home daily for 15 minutes. Figure 10. In-phase coordination pattern. Patient lies comfortably supine; if desired, a small pillow can be placed under knees to reduce stress in the lumbar spine. Bilateral, symmetric, rhythmic rotation of upper and lower extremities is performed in a simultaneous fashion (rotation occurs at hips and shoulder levels, respectively). The elbows are flexed to 90° to improve awareness of how rotation occurs in the shoulders. Gentle scapular retraction is performed during the shoulder external rotation and then maintained while returning to internal rotation. A short rest of scapular retraction is solicited before beginning a new sequence. The patient was treated 27 sessions over a period of 5.5 months. During the first two months she was seen an average of 2 times per week, and then 1 time per week for the remaining period. By the end of the treatment program, the patient reported complete resolution of symptoms with a fully restored capacity to perform daily activities. (Figure 11) Additionally, she was able to resume light physical activity without flare-up (elliptical machine). Clinical examination performed at the last session revealed no pain provocation with active trunk and neck movements, normal reflex testing, and absence of pain with palpation. Very minimal fascial restrictions were noted in the mid thoracic spine, however significant improvement was noticed compared to baseline. Final assessment revealed normal segmental mobility in the thoracic spine and there was no reproduction of upper extremity paresthesia when performing thoracic posterior anterior-mobilization. Table 3. Results of the Fear Avoidance Belief Questionnaire (FABQ) for Physical Activity (PA) and Work (W), and the Fibromyalgia Impact Questionnaire (FIQ) at initial evaluation and every 2 months after initial evaluation. Figure 11. 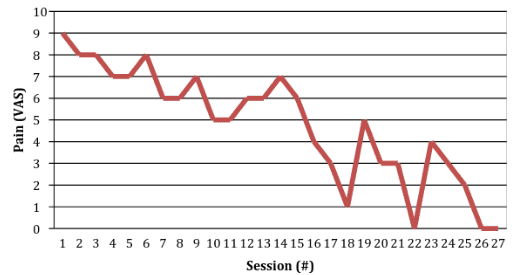 Evolution of pain score during treatment program. Pain was measured using Visual Analog Scale (VAS). In this case, application of posterior-anterior mobilization on T4 in relation to T3 provoked the patient’s symptoms in the upper extremities and back. After application of 3 minutes of a posterior-anterior oscillatory technique at T3-4 the patient demonstrated reduction of swelling and redness in both hands, and a significant improvement of pain and paresthesia in her back, upper and lower extremities, which further supported the clinical diagnosis of T4 syndrome. Thoracic posterior-anterior mobilization has been effectively used in prior case reports on patients with T4 syndrome.8,19,34 Joint mobilization effects on sympathetic system and pain modulation has been widely studied, and evidence supports an analgesic mechanism mediated by activation of the dorsal portion of the periaqueductal grey (dPAG) in the midbrain, and an excitatory effect on the sympathetic system.4,5,18,20-24,28,30,33,35 This has been described as a non-opioid, noradrenergic pain control system, using norepinephrine as a neurotransmitter.35 Consequently, in a study of Jousey et al, a grade III posterior-anterior mobilization technique applied to the T4 vertebrae at a frequency of 0.5 Hz caused a sympathoexcitatory response consisting of an increase in skin conductance in the hands.15 It was suggested a “rebound phenomenon” as an explanation for the sympathetic-mediated analgesia induced by this technique; joint mobilization increases sympathetic activity, which may return to levels below their pre-technique values. This fact supports the use of an oscillatory technique at the aforementioned frequency to achieve the analgesic effects. Additionally, holding the application of the technique until the patient’s symptoms resolve seems to be necessary to down-regulate sympathetic activity. In this patient’s case, technique application took from a few seconds to several minutes before she experienced resolution of symptoms. It has been proposed that low-to-moderate intensity exercise induces hypoalgesia in patients with chronic pain conditions.22 In this regard, the most accepted mechanism responsible for this pain modulation is associated to the activation of endogenous opioid and/or non-opioid systems.22 Furthermore, cortical activation of the M1 area may lead to activation of neural systems responsible for the reduction of thalamic activity. The balanced activation of M1 and the thalamus is associated with improvement in motor control, an important factor to reduce maintenance of pain.34 In fact, motor learning may be involved in pain threshold modulation, therefore adding cognitive effort into motor training may allow further pain reduction.34 Taking this information into account, the appropriate exercise selection may contribute to enhanced pain modulation processes, thus complementing manual therapy effects. It was decided to incorporate a bimanual in-phase exercise pattern to promote cortical activity associated with pain modulation, in a stable simple way without the need for prior practice. This seems to be appropriate for this case considering the significant irritability and functional impairment of the patient. In order to add a cognitive component to the in-phase coordination, gentle scapular retraction hold while performing in-phase shoulder external-internal rotation was incorporated, thus stimulating motor learning processes involved in further pain modulation and improvement of motor control strategies. It’s been proposed that T4 syndrome is associated with increased sympathetic activity, which in turn explains the referred symptoms to both upper extremities. Evans proposed a model in which sustained inappropriate postures may provoke ischemia in thoracic spine structures thereby causing referred symptoms.10 In a study by Keating et al, posterior-anterior mobilization elicited a subjective report of discomfort in 37% of the asymptomatic study group, which was more frequent in the T4, T5 and T6 segments.16 It was theorized that the proximity of the thoracic nerves to contractile structures was the cause of these results, since the medial branch of the dorsal rami from T1 to T5 lies over the apex of their corresponding spinous process, close to the tendinous insertion of the splenius cervicis (T3, T4 and T5). In this way, increased forward bending or slumped positioning may not only cause an ischemic injury, but also increase tension on the dorsal structures in the thoracic spine and cause mechanical irritation of the neural structures. Nerve damage has been linked to sympathetic fiber sprouting into the dorsal root ganglia (a structure that usually has poor sympathetic innervation), perhaps explaining a connection between sympathetic and nociceptive systems due to neural tissue dysfunction.17 In this way, neural irritation of thoracic dorsal ramus could cause sympathetic mediated pain in the corresponding referred pain pattern; head and neck are supplied by T1-4, and the upper trunk and upper extremity by T1-9.1 In support of this theory, Gonzalez-Darder reported complete resolution of a patient’s interscapular, neck and arm symptoms by decompression surgery of the T3, T4 and T5 nerves due to presence of osteophites causing neural entrapment.14 This may also explain why paraspinal infiltration with local anesthetic at the T4 level results in significant relief of symptoms in patients with T4 syndrome.19 In this same study, patients reported relief of symptoms by the administration of gabapentin, a medication used for neuropathic pain conditions, perhaps further supporting the relationship between nerve damage/irritation and sympathetic mediated pain. In summary, T4 syndrome has been linked to increased sympathetic activity due to dysfunction in the upper thoracic spine. However, findings in this case report suggest involvement of several other segments besides T4, which exposes a more complex scenario: as complex as ANS function. Important components of the treatment of a patient suffering from T4 syndrome may include soft tissue mobilization and stress-anxiety management techniques, which have demonstrated beneficial effects at a sympathetic level. Thoracic joint mobilization techniques remain the center of treatment in patients with T4 syndrome. Exercise therapy should be incorporated into the treatment plan to take advantage of its analgesic effects and improve patient’s function. This information is valid not only for patients suffering from T4 syndrome but for any condition that presents with symptoms associated with sympathetic mediated pain, as it has been suggested in fibromyalgia and other chronic pain conditions.17 Future research should focus on further insights into the pathophysiology of T4 syndrome and the specific effects of treatment techniques in these patients. Increased understanding of T4 syndrome may help improve knowledge about the possible role of the ANS in common musculoskeletal conditions. Bogduk N. Innervation and pain patterns of the thoracic spine. In: Grant R, editor. Physical therapy of the cervical and thoracic spines.3rd ed. Edinburgh, Scotland: Churchill Livingstone;2002. p. 73–84 ch 5. Castro-Sánchez AM, Matarán-Peñarrocha GA, Arroyo-Morales M, Saavedra-Hernández M, Fernández-Sola C, Moreno-Lorenzo C. Effects of myofascial release techniques on pain, physical function, and postural stability in patients with fibromyalgia: a randomized controlled trial. Clin Rehabil. 2011 Sep;25(9):800-13. Castro-Sánchez AM, Matarán-Peñarrocha GA, Granero-Molina J, Aguilera-Manrique G, Quesada-Rubio JM, Moreno-Lorenzo C. Benefits of massage-myofascial release therapy on pain, anxiety, quality of sleep, depression, and quality of life in patients with fibromyalgia. Evid Based Complement Alternat Med. 2011;2011:561753. Chiu TW, Wright A. To compare the effects of different rates of application of a cervical mobilisation technique on sympathetic outflow to the upper limb in normal subjects. Man Ther. 1996 Sep;1(4):198-203. Conrad A, Müller A, Doberenz S, et al. Psychophysiological effects of breath- ing instructions for stress management. Appl Psychophysiol Biofeedback. 2007;32(2):89-98. Conroy JL, Schneiders AG. The T4 syndrome. Man Ther. 2005 Nov;10(4):292-6. DeFranca GG, Levine LJ. The T4 syndrome. J Manipulative Physiol Ther. 1995 Jan;18(1):34-7. Evans P. The T4 syndrome: some basic science aspects. Physiotherapy 1997;83(4):186–9. Fernández-Pérez AM, Peralta-Ramírez MI, Pilat A, Villaverde C. Effects of myofascial induction techniques on physiologic and psychologic parameters: a randomized controlled trial. J Altern Complement Med. 2008 Sep;14(7):807-11. Field T, Diego M, Hernandez-Reif M. Moderate pressure is essential for massage therapy effects. Int J Neurosci. 2010 May;120(5):381-5. Geerse WK. Bilateral leg symptoms–the T10 syndrome?. Man Ther. 2012 Jun;17(3):251-4. González-Darder JM. Thoracic dorsal ramus entrapment. Case report. J Neurosurg. 1989 Jan;70(1):124-5. Jowsey P, Perry J. Sympathetic nervous system effects in the hands following a grade III postero-anterior rotatory mobilisation technique applied to T4: a randomised, placebo-controlled trial. Man Ther. 2010 Jun;15(3):248-53. Keating L, Lubke C, Powell V, Young T, Souvlis T, Jull G. Mid-thoracic tenderness: a comparison of pressure pain threshold between spinal regions, in asymptomatic subjects. Man Ther. 2001 Feb;6(1):34-9. Martinez-Lavin M. Fibromyalgia: When Distress Becomes (Un)sympathetic Pain. Pain Res Treat. 2012;2012:981565. McGuiness J, Vicenzino B, Wright A. Influence of a cervical mobilization technique on respiratory and cardiovascular function. Man Ther. 1997 Nov;2(4):216-220. Mellick GA, Mellick LB. Clinical presentation, quantitative sensory testing, and therapy of 2 patients with fourth thoracic syndrome. J Manipulative Physiol Ther. 2006 Jun;29(5):403-8. Moulson A, Watson T. A preliminary investigation into the relationship between cervical snags and sympathetic nervous system activity in the upper limbs of an asymptomatic population. Man Ther. 2006 Aug;11(3):214-24. Naugle KM, Fillingim RB, Riley JL 3rd. A meta-analytic review of the hypoalgesic effects of exercise. J Pain. 2012 Dec;13(12):1139-50. Ridderikhoff A, Peper CL, Beek PJ. Error correction in bimanual coordination benefits from bilateral muscle activity: evidence from kinesthetic tracking. Exp Brain Res. 2007 Jul;181(1):31-48. Silvestrini M, Cupini LM, Placidi F, Diomedi M, Bernardi G. Bilateral hemi- spheric activation in the early recovery of motor function after stroke. Stroke. 1998 Jul;29(7):1305-10. Simon R, Vicenzino B, Wright A. The influence of an anteroposterior accessory glide of the glenohumeral joint on measures of peripheral sympathetic nervous system function in the upper limb. Man Ther. 1997 Feb;2(1):18-23. Staines WR, McIlroy WE, Graham SJ, Black SE. Bilateral movement enhances ipsilesional cortical activity in acute stroke: a pilot functional MRI study. Neurology. 2001 Feb 13;56(3):401-4. Stinear JW, Byblow WD. Disinhibition in the human motor cortex is enhanced by synchronous upper limb movements. J Physiol. 2002 Aug 15;543(Pt 1):307-16. Vicenzino B, Collins D, Benson H, Wright A. An investigation of the interrelationship between manipulative therapy-induced hypoalgesia and sympathoexcitation. J Manipulative Physiol Ther. 1998 Sep;21(7):448-53. Wright A. Hypoalgesia post-manipulative therapy: a review of a potential neurophysiological mechanism. Man Ther. 1995 Nov;1(1):11-6.